Review by AllTheBestFights.com: 2015-12-19, Junior dos Santos vs Alistair Overeem gets three stars only thanks to a good finish. The black belt in Bjj and former Ufc Hw champion Junior dos Santos entered this fight with a pro mma record of 17-3-0 (82% finishing rate) and he is ranked as the No.3 heavyweight in the world (currently the #1 in this division is Fabricio Werdum). JDS suffered his last loss in 2013 when he faced Cain Velasquez in their third battle (=Velasquez vs dos Santos 3), after this bout ‘Cigano’ fought just once beating Stipe Miocic in 2014 (=dos Santos vs Miocic). His opponent, the former K-1 and Strikeforce champion Alistair Overeem, has a record of 39-14-0 (90% finishing rate) and he entered as the No.9 in the same weight class. ‘The Reem’ lost to Ben Rothwell last year (=Overeem vs Rothwell) but then he has won over Stefan Struve (=Overeem vs Struve) and Roy Nelson (=Overeem vs Nelson). 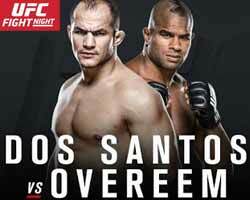 ‘Cigano’ dos Santos vs Overeem is on the undercard of Rafael dos Anjos vs Donald Cerrone 2 – UFC on Fox 17. Watch the video and rate this fight!